"In Buddhism, the seven gifts that require no possessions are: (1) gentle eyes, looking at others kindly; (2) a smile and kind expressions; (3) words, speaking kindly to others; (4) physical body, acting properly and treating others with respect; (5) heart, touching others with a heart full of love; (6) a resting place, offering others a place to sit and rest; and (7) shelter and lodging, providing others with a room or warm place to stay. 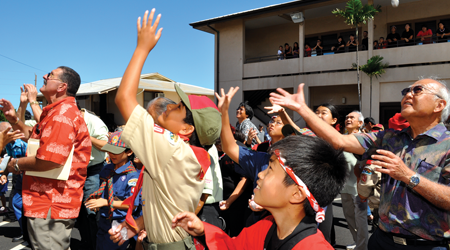 -Gomonshu Koshin Otani from The Buddha's Wish for the World"
THE CENTRAL MAUI DISTRICT’S FLOWER FESTIVAL (Hanamatsuri) is held the first Sunday in April at the Velma McWayne Santos Community Center in Wailuku. As you know, Gautama Buddha was born in April about 2,600 years ago in Lumbini Park which is located on the northern part of India. The Lumbini Park is located in the country of Nepal. Most Buddhist societies celebrate his birth at a special event with warm feelings of joy and happiness. 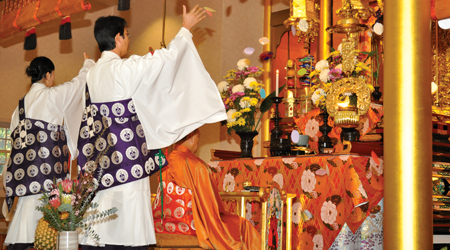 At the Velma McWayne Santos Community Center, we not only have Hongwanji members attend but members of the other Buddhist sects, such as Puunene Nichiren Mission, Wailuku Shingon Mission, and both Kahului and Wailuku Jodo Missions. 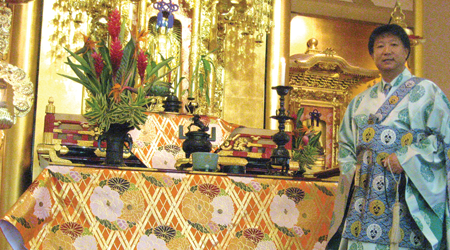 Together, with Kahului, Makawao, and Wailuku Hongwanji, a Buddhist service is held. We chant the sutra "Kanmoku-ge," the sutra of “pouring of sweet tea.” The entire congregation pours sweet tea on the statue of baby Buddha. I personally feel that this is a joyous and happy occasion for all Buddhists to celebrate Shakyamuni Buddha’s birth. We rejoice together in happiness with our dharma friends. This "Flower Festival" is a time for rejoicing to commemorate the birth of Gautama Buddha. For this service, a beautiful flower decorated pavilion is set up representing the Lumbini Park where Gautama Buddha was born. In the Flower Pavilion, we place a statue of a baby Buddha, and pour sweet tea over him. The legend states that when Gautama Buddha was born, sweet rain fell from the sky to bathe the body of the baby Buddha, thousands of beautiful flowers bloomed everywhere, and uncountable numbers of flower petals fell from the sky. It was like Mother Nature celebrated Gautama Buddha’s birth. According to legend, when the time for Prince Siddhartha’s birth got closer, Queen Maya prepared to make the journey to her mother’s home, where the child would be born in accordance with the custom of the time. While on her journey, she stopped to rest at a beautiful flower park called Lumbini. While she rested in the garden, she saw beautiful flowers on a tree. Queen Maya went to the tree, and as she raised her right hand to grasp the flowers of the Asoka tree, the Buddha was born from Queen Maya’s right side of her armpit. Then, right after Buddha was born, he stood up and took seven steps, pointed his right hand to the sky and left hand to the earth, and said the following words: "Above and below the heavens, I alone am the World-Honored One." Wow, this baby must have been a superhuman being. I believe that this story was created by someone in the Buddhist society. However, this story reminds and teaches us that each one of us is a very precious person, and we all are equal. Of course, Buddha is the person who is the Enlightened One who guided countless number of people in the world and gave us the spiritual encouragement through his great and kind messages. However, when I think about the Buddha’s story, I believe that there are several ways to interpret the story. 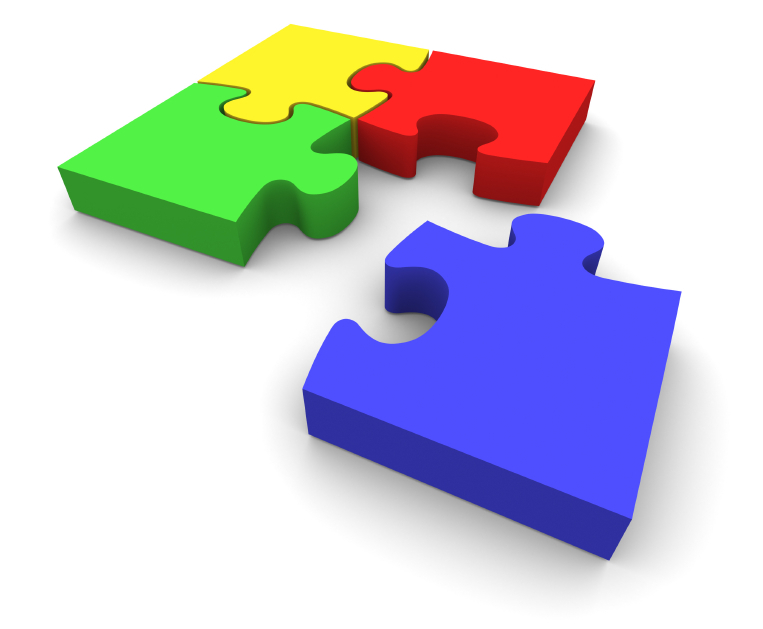 One way to interpret the story is, "Each of us, your life and my life, are precious. Each of us is the truly honored one. No one can replace your life or my life. All of us are working not only for one’s own benefit but also benefits our community or society. So each one of us is truly The Honored One. The second interpretation is "We are able to share Buddha’s true heart and guidance—not only with our family members but also with our community through our daily lives. Yes, we are able to share our joy and happiness with our community through the Dharma with a thoughtful mind and sincere heart." Why? Because our lives are interdependent. Let me share with you a story that illustrates the concept of a peaceful mind. As you know, Buddha traveled from village to village to share his great Dharma with his followers. At one of the villages, people were expecting Buddha to arrive late at night. So everyone was asked to get candles to welcome him with full light. All of the village people purchased candles and kept their positions on the side of the road. The rich people purchased huge candles and kept their position at the main entrance of the town. However, there was a poor lady who wanted to buy a candle, but she didn’t have any money to purchase it. She went to many candle shops and begged for a small candle but all of them denied her. At the last candle shop, she told the owner, "I will shave my black hair so, may I buy a candle?" She sold her own hair and purchased the smallest candle. When night came, everyone lit their candles. Wow, the village became just like Las Vegas — so bright with thousands of candles. However, just before Buddha’s group arrived at the village, a strong wind blew all of the candles out except for the smallest one, which the poor lady held. When Buddha and his disciples entered the village, her light became brighter and covered the entire village. Buddha stopped in front of the poor lady, kneeled on his knees, and said, "Thank you very much. I received your sincere heart and it will always be showing me the path of truth." For us to learn Buddha’s guidance, we only need "To have a mind of caring for others, listening to the teachings of the Buddha Dharma without having any doubts, and relying upon Buddha’s great wisdom and compassionate heart in our daily lives. Buddha’s teachings show us the path of the truth in our daily lives and help us to see the reality of our lives itself." On this special occasion (Flower Festival), may we all rejoice in the spiritual guidance provided by the Buddha and pass it on to the next generation. Buddha’s teaching can be stated as follows: “True community has faith and wisdom that illuminate it. It is a place where the people know and trust one another and where there is social harmony.” In fact, harmony is the life and real meaning of a true community or organization. Please remember that whatever we have in our lives, such as a kind heart, sincere action, sympathy with tears, and warm feeling of joy; these are all precious gifts that we received from our ancestors and Buddha’s guidance. This is the reason why we celebrate Buddha’s birth with a sincere mind of gratitude. The Nembutsu path is Buddha’s guidance that shows us the ways of truth and teaches us to rejoice in the happiness with others. Our Issei pioneers—first generation who came to Hawaii about 150 years ago—cultivated this land. The Nisei and Sansei (the second and third generations) built this temple for us to receive the spiritual guidance and happiness. Now, it is for us to rejoice in this happiness with our children, grandchildren, and friends and pass it on to our community. One of Shinran Shonin’s great masters, Tao Cho of China said, "People who were born before us guided people who came next, people who are born after us followed the guidance and walked the firm path of truth." Remember Dharma friends, we are inheriting guidance of the Nembutsu that brings us happiness and joy through our precious lives. Buddhism is joy and happiness which all of us are able to discover in our daily lives. So let’s listen to the Buddha Dharma as our spiritual guide and follow the path of the truth in our precious lives. "Flower Festival" is for us to be aware that we all are embraced in Buddha’s great wisdom and compassion.